Jabba the Hutt is a minifigure based on the a slug-like Hutt crime boss and gangster in the Star Wars universe. 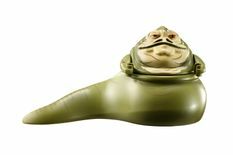 Jabba the Hutt was released in two variations. Both are fairly accurate to the movie character and are in the shape of a very large slug with stubby arms and a face. This variant is all sand green and features no printing. It has a large and bulbous body with, with two pieces that are added on making up that tail. The arms are short and can move up and down. The hands can grip objects the same size as those held by minifigures. As there is no printing, the mantle of recreating the recognizable features of Jabba falls upon the mould. This was done very accurately, with wrinkles and folds of skin below the chin and around the eyes, a wide, thin mouth and two drawn-out, nearly horizontal nostrils. This version of Jabba does sport printing, and as such is far more detailed than its predecessor. It is mainly olive green and has a light nougat face. The tail and body are one piece and sport printing of faint stripes on the tail and wrinkles below the chin. The head piece is not connected to the body and must be attached. This gives it the ability to swivel 360 degrees. The mould, although not as detailed as the previous version, depicts the chin, mouth and bulge of the eyes. The printing completes the effect, giving Jabba a brown mouth and nostrils and orange eyes - one of which is opened wider than the other - with large black pupils and wrinkled eyelids. The arms are olive green as well and the hands again can hold minifigure-scale objects. Jabba the Hutt was a ruthless gangster who had a large criminal empire on Tatooine. He used to lead podracing with his assistant, Bib Fortuna. This empire spanned from before Star Wars Episode I: The Phantom Menace to during Star Wars Episode VI: Return of the Jedi. He plays a large role in the beginning of the latter film when Luke Skywalker, Princess Leia, Chewbacca, and Lando Calrissian rescue Han Solo, who had given to the Hutt by Boba Fett owing to a non-payment. This infiltration of Jabba's Palace to rescue Han resulted in a battle atop the gangster's luxury craft, Jabba's Sail Barge, and his death by strangulation at the hands of Princess Leia. Jabba employed a host of bounty hunters, smugglers, assassins, and bodyguards to operate his criminal empire. His palace on Tatooine had a host of entertainers at his disposal, including - but likely not limited to - slaves, droids, and alien creatures. Jabba had a dark sense of humor, a large appetite, and affinities for gambling, slaves, and torture. Jabba also appears in LEGO Star Wars: The Padawan Menace, where he sentences C-3PO and R2-D2 to fight to the death. However, they escape. In LEGO Star Wars II: The Original Trilogy and LEGO Star Wars: The Complete Saga, Jabba The Hutt is a non playable character. He has coloured eyes, mouth, and nostrils. 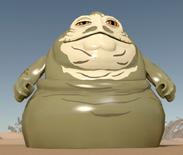 If a series of glitches occur in the right order, some of which are triggered by the players actions, Jabba can be used as a character. On the preliminary box art for the set, Jabba the Hutt's figure is white. Jabba in the LEGO Star Wars II video game. Facts about "Jabba the Hutt"
This page was last edited on 10 August 2016, at 10:40.